Although my collection consists mostly of coins, I have been branching out into some areas of currency. Other than collecting Israeli currency, I am not sure what direction I want to go. Since 2007, the Bureau of Engraving and Printing has issued a yearly $2 Single Note Collection where each folder has a $2 note from each of the Federal Reserve branches and the serial number begins with the year, allowing for only 10,000 collectibles per Fed branch (YYYY0000-YYYY9999). This year, the Single Note is just being issued for the Federal Reserve Band of Kansas City. This is not good for someone who has only purchased the notes from the New York Fed. This year represents the sesquicentennial of the Bureau of Engraving and Printing. Formed as a result of the National Currency Act, the Department of the Treasury opened the National Currency Bureau in a basement office of the Treasury Building on August 29, 1862 to cut and manage the fractional currency that was being printed for the government. With the passage of the National Bank Act of 1863 centralizing currency production with the federal government, the office became its own bureau with a mission to print currency and other security documents. The name was changed a few times before it was settled on the Bureau of Engraving and Printing. Sales of the set will be handled by the U.S. Mint and scheduled to begin on August 7, 2012, at 12:00 Noon. Sets will cost $72.95 with no purchase or production limits announced. Considering that the serial number is eight digits long, the de facto limit will probably be 100,000 sets. Limited edition, three-note set features Series 1995, 2001 and 2009 $10 notes, with matching low serial numbers, from the Federal Reserve Bank of Philadelphia. 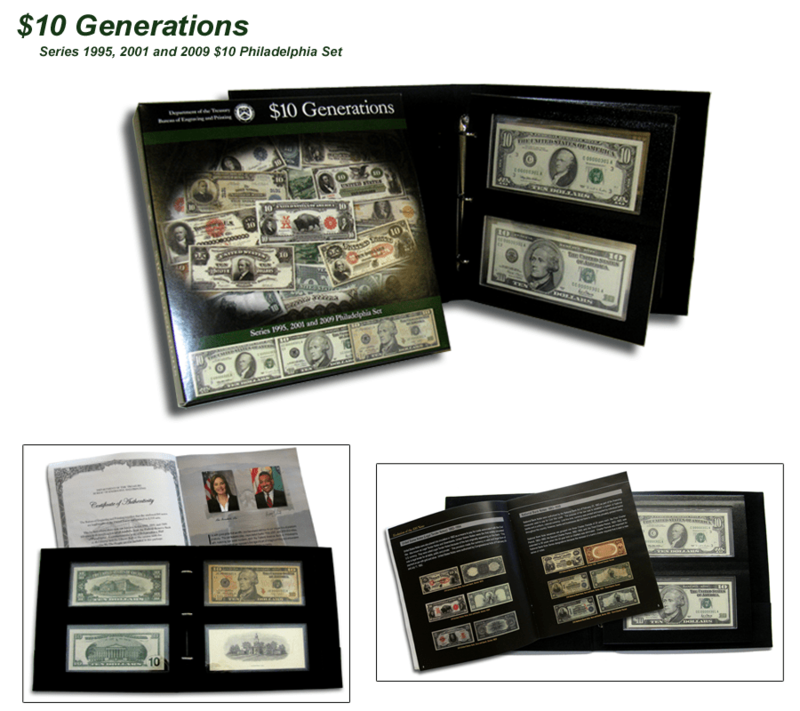 Just announced on July 30, 2012, a new product is the “$10 Generations Set.” This will be a three-note set with Series 1995, 2001 and 2009 $10 notes, with matching low serial numbers, from the Federal Reserve Bank of Philadelphia. The three notes represent the three designs of the small size $10 Federal Reserve Note. BEP began printing the small-sized notes starting in 1928 with the Series 1929 notes. Since then, the basic designs had note changed until the re-design effort that began in 1996. The $1 Federal Reserve Note continues to use the design similar to that first circulated in 1929. The set will be in a leatherette binder with the notes stored in acid-free polymer sleeve. Included in the set will be a commemorative print of Independence Hall with the Liberty Bell and “We the People” on the reverse. It will also include a booklet about the history of the $10 note since 1861. Sales will begin on August 7, 2012. There will be a limit of 3,333 set priced at $149.95, $135 for purchasing ten or more with a 25 set purchase limit the first week. Since August 7 is the first day of the World’s Fair of Money in Philadelphia, I wonder if the U.S. Mint and the Bureau of Engraving and Printing will have sets there for sale?